This morning I awoke to driving winds and pouring rains. My first reaction was to roll over and go back to sleep but I'm at work at Christian Horizons and there are responsibilities that need to be carried out. After getting the guys in my care off to their respective programs this morning, I have a breakfast engagement about 45 miles from here. It's one of those days when sitting by a fire with a good book would be "just fine" for me. I hope you have a great day. Let's remember to pray for those who have no bed to sleep in, no breakfast to eat and no hope for the future. Our hope is in Jesus alone. He gives hope where there is no hope, peace where there's only been chaos and eternal life for those who trust in Him. 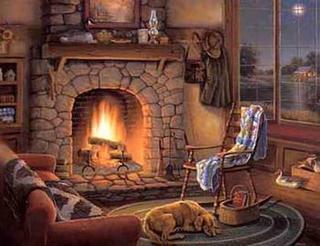 P. S. Thanks, Debra, for the great "fireplace" picture.